I'm so ready for this to be over. 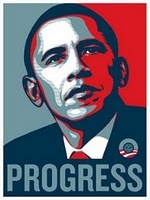 ← BTW, the Obama PROGRESS poster was designed by artist Shepard Fairey. Signed originals are selling for thousands on eBay. There was a good story about them in Sunday's Washington Post.